Finals MVP: Asami Yoshida (166-PG-87) of JX-Eneos S.
Player of the Year: Ramu Tokashiki (193-F/C-91) of JX-Eneos S.
Forward of the Year: Ramu Tokashiki (193-F/C-91) of JX-Eneos S.
Coach of the Year: Kiyomi Sato of JX-Eneos S.
F: Yuki Miyazawa (182-F-93) of JX-Eneos S.
F/C: Ramu Tokashiki (193-F/C-91) of JX-Eneos S.
Ryoko Yano (178-F-78) of Toyota A.
Aya Watanabe (169-G/F-92) of Mitsubishi K.
Saki Iijima (172-F-92) of Niigata R.
JX-Eneos claimed WJBL title. They overcame Mitsubishi Koalas tonight to complete the sweep of the Finals. The guests took control from the first minutes by winning first half. But Mitsubishi K. won third quarter 27-17. However it was not enough to take a lead and get a victory that evening. JX-Eneos S. made 17-of-22 free shots (77.3 percent) during the game. JX-Eneos S. outrebounded Mitsubishi K. 40-25 including 16 on the offensive glass. They looked well-organized offensively handing out 21 assists. Great defensive blocking was one of the keys in this match when JX-Eneos S. made 8 blocks. The former international power forward Ramu Tokashiki (193-91) orchestrated the victory with a double-double by scoring 24 points and 12 rebounds. 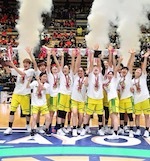 International forward Yuki Miyazawa (182-93, college: Queens, NY) contributed with 21 points, 5 rebounds, 5 assists and 4 blocks for the winners. The former international swingman Aya Watanabe (169-92) replied with 33 points (!!!) and international forward Nemoto Haruno (173-95) added 25 points in the effort for Mitsubishi K.
JX-Eneos fired past Mitsubishi Koalas in WJBL Finals opener. The game without a history. JX-Eneos S. led from the first minutes and controlled entire game increasing their lead in each quarter. It was a great shooting night for JX-Eneos S. especially from behind the arc, where they had solid 52.6 percentage. They looked well-organized offensively handing out 25 assists. Great defensive blocking was one of the keys in this match when JX-Eneos S. made 7 blocks. Worth to mention a great performance of the former international power forward Ramu Tokashiki (193-91) who helped to win the game recording 16 points, 9 rebounds and 6 assists (on 7-of-9 shooting from the field). International forward Yuki Miyazawa (182-93, college: Queens, NY) contributed with 22 points, 6 rebounds and 4 blocks for the winners. Point guard Mai Kawai (171-96) answered with 18 points and international forward Nemoto Haruno (173-95) added 15 points and 5 rebounds in the effort for Mitsubishi K.Five JX-Eneos S. and four Mitsubishi K. players scored in double figures.